While sitting in the Morgan County courtroom listening to the judge call all the cases, I saw one injury victim appear before the court without his lawyer. His case involved a claim of an occupational disease. I listened to him explain the lack of a lawyer. He hired a Birmingham billboard lawyer who thought it was a simple workers’ compensation case that would quickly settle. Wrong! I can tell you — occupational exposure cases are rarely simple. While they might settle, you better prepare the case. I’ve tried several of those cases in that very courtroom. They all involved complex medical issues. When the billboard lawyer figured out it was not a simple case to settle, he dropped the client. Now that injured person was standing, all alone, before the judge asking for time to find a new lawyer. In some cases, the settlement mill lawyer actually harms a good case making it more difficult to win later. I asked at the beginning — Where are the real injury lawyers? Real injury lawyers are actually preparing and presenting cases for their clients. 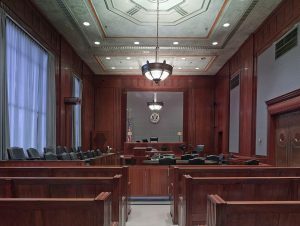 Where are the settlement mill lawyers who falsely claim to be injury lawyers? They certainly are not in local courtrooms when injury cases are called to trial. They are mainly marketers spending their time on advertising. When they sign a case, they are on the phone making the quickest settlement possible. Hard work makes cases better. Trial preparation makes cases better. That hard work puts cases in a position to maximize the result. Yes, the vast majority of cases settle. But, preparation makes better settlements and better trials. If you have a small case, a quick phone call and quick settlement may be fine. However, if you are seriously hurt, look for an attorney that is serious (does not just act serious in an ad) and will really work for you. Your case is too important to trust with the attorney who has no intention to prepare the matter for trial if needed. At the Blackwell Law Firm we focus on helping our injured clients. We work hard to prepare our cases. We specialize in personal injury cases, including car accidents, workplace injuries and defective product injuries. When not in court or deposition, we spend our time studying and discussing the law within our specialty. If you are seeking information, we hope our articles and blog posts are helpful. If you have questions or would like to discuss a legal matter, give us a call. We are happy to talk.